I was the youngest of 6 kids growing up in rural Pennsylvania. And by rural I mean dirt and gravel roads, a chicken coop, and a mountain right in my backyard. My nearest neighbor was half a mile away. My parents moved there to further their course of ‘isolationism.’ You see, they had been dabbling in Fundamental Christian Legalism, which, at heart, is pride in what you don’t do and who you don’t associate with. The end result is that you condemn everybody everywhere except the small group of Christians who believe exactly as you do and you call all those condemned ‘The World.’ Now being around ‘The World’’ could mess up your thoughts and lead you astray so it was best to move as far away from anybody as possible. My folks weren’t always this way. When they met in NYC and got married they were young and free and sharp, with wide open hearts, hungry for knowledge, and ready to jump at a hair’s twitch into esoteric wrangling with total strangers. So a year before I was born, 1971, their house, which was just finished being built, burnt to the ground. No one was hurt, but a strange thing happened. Being suddenly without food, shelter and clothing, my parents had to rely solely on the kindness of the neighbors. Strangers. ‘The World.’ And would you believe it, within a 10 mile radius, it seemed like every neighbor there was came with boxes of stuff to the Muckaloe’s, the old couple who took in this family of 7. Well, you can imagine what that did to my parents. They were pretty broken down. There wasn’t enough debris in the water to build a legalist raft. A complete reversal of thought ensued. It was as though the blindfold had been removed, and people became people, not enemies. All those feelings their marriage was built upon in NYC flooded back. And six months later, when the new house was erected, I was conceived. I say all this so you know the spirit I was handed at my beginning, and that is one of acceptance and love for all people, a spirit of hope reborn, and a spirit of enjoyment for life (like the freshly pardoned death row guy reveling in the intensity of a bee sting.) I was also handed the task of verbalizing this spirit, often into the teeth of my siblings who were heavily indoctrinated in the ‘we are better than everyone else’ mindset. The platform of expression I chose was Art. In first grade when we had to write down what we wanted to be when we grew up, I wrote down Artist, and in my mind’s eye I pictured myself in a beret and smock, my thumb sticking through my palette with all the colors, squinting at my easel on the streets of Paris. And then I saw myself, with a flourish, making one daub at my canvas and it being Magic. This magic was the indescribable embodiment of freedom. The ecstasy of abandoning rational process for intuitive marksmanship. Pure Conquistadorian Idealism beyond what even my parents could imagine. Of course, in first grade I didn’t think with such big words, it just seemed The Artist was the most magical of people. At least once a year my family would make a trip to New York City for a day. We’d wander through the village and review my parent’s old stomping grounds. Inevitably we’d pop into the MET for an hour mainly to see ‘Irises’ by Van Gogh; my Mom’s favorite painting. I was always overwhelmed. I remember thinking, if I was going to be an artist I needed to have strong opinions about every painting, whether it was Art or not. This was a ridiculous endeavor for an inexperienced kid, or anybody, for that matter and it stemmed from worshipping my older brother Mark, who, in order to be better than everyone else, condemned or condoned with impunity. He was a fantastic artist, though, as was my sister Keren, and I had no other lifeline to the art world. So we’d stand in front of a Bruegel, and my brother would ask his disciple, “What do you think, is this Art?” and I would stare and say “Umm….Yes?” “Right,” he’d say and we’d move on to a Chagall. “What about this one? Is it Art?” “Ummm….Yes?” “No. Look at this; he has no IDEA what he’s doing.” And I’d think “I have no idea what I’M doing.” Can you see how far this was driving my mind away from my 1st grade imaginings? From the idea that Everything is Art. That one stroke by the artist is enough, and 10,000 strokes are not too many. That whatever the artist makes is Art even if a thousand people incorporate against it. Even if the artist says “It’s not Art;” it’s still Art. So I became tentative and fearful that what I made would not live up to the rigorous yet nebulous standards of my brother. I abandoned the idea of “Voila!” and narrowed my focus to realism. Then in sixth grade I entered a competition in which I was to choose one artist from a given list and paint 2 replicas of their work and a third piece in their style. I chose Cezanne. Not because I liked him, (he actually was on the “Not Art” list) but because I had never made an acrylic painting or copied a master, and Cezanne seemed the easiest to duplicate. 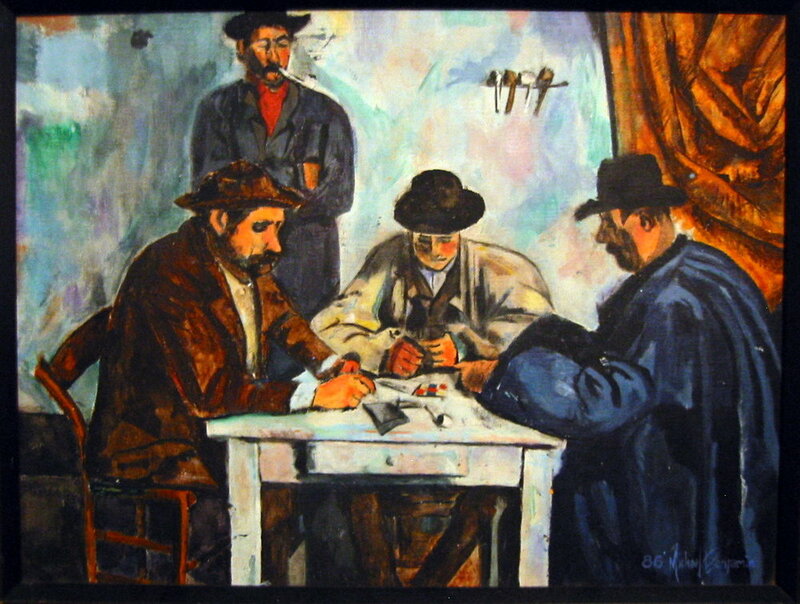 It was my Mom’s idea that she and I drive to NYC and go to the MET to see Cezanne’s ‘Card Players’ in person before I painted it. Being there without my brother, I felt exposed. Like I had to carry the burden of judging what was and was not Art, and it was obvious I had no clue. But things changed when I got home and started the painting. I discovered the card table, which I thought was blue even staring at the original, was actually a weaving of blue, yellow, pink, and green, and this subtlety of color pervaded the masterpiece. I found where my mind wanted a line there was none and where a shape should be was only juxtaposed colors. I was blown away. By the time I finished the painting, this Cezanne, who I was trained to despise, had lit up my mind from one end to the other, and my brother’s folly became transparent. I now had Experience, small as it was, to understand Art. I had crawled through the mind of a master on my own steam. Wow. Did that ever feel good. By 10th grade I had outgrown the art program in my high school. I overheard our kindly but self centered art teacher saying, “Oh, Michael? He’ll never be an artist.” I assume he thought I would pursue acting, as I was receiving more awards in that arena. If I hadn’t had my heart set fully on making art, that comment redoubled my resolve. In 11th grade we moved to the Harrisburg area, and my new school was triple the size, and the art teacher, Selby Doughty, really taught Art. She didn’t care if I was the best artist in the world; she was going to make me better. And did she ever! She helped break down walls I didn’t know were there. She taught me to see color, to fall in love with dance, to appreciate Frank Sinatra, to embrace abstraction, and she was always saying, “There is no such thing as bad Art.” Senior year I applied only to schools in NYC. Cooper and Parsons rejected me, but I got in to Pratt for the fall of ‘92. There is nothing like being immersed in Art 24/7 with students who want to learn and teachers who want to teach. Pratt was incredible. If Selby Doughty was church, Pratt was heaven. Halfway through the year I took on cubism and my mind and heart began experiencing things I could never put into words; only paint. Unfortunately at the end of one year my dad took an early retirement, and I could no longer afford to go. I applied to Cooper a second time. A third time, and finally, I was accepted for the Fall of ‘94. (Cooper is free if you get in.) This was a much different experience. For one, the caliber of the students was far greater, yet there was a pervading attitude of “I am the best” which starts to look pretty silly when everyone is doing it. I discovered how deep that arrogance ran in myself and began fighting it. Secondly, the focus of the teaching was not on making your art better but on how to talk about your art. How to inflate your art with words which is great for selling it but seems to borrow from the enthusiasm for making it. Your intellectual world of words starts to take on more substance than the ground of your heart. If Pratt was heaven, Cooper was being in space with no gravity, drifting farther and farther from your ship. I suppose that’s a very bleak picture of it. After 2 years I took a leave of absence to help my family build a house, and never went back. What I did come away with was the deepest respect and admiration for a handful of students who did not succumb to the politics and artistic banter yet forged ahead with some of the most beautiful Art I have ever seen. In 1999 I moved to Bloomington, Illinois to be near a love interest in Chicago. I worked two jobs of note: one was a house painting job in which, I swear, I learned more about handling paint in 6 months than all my years of schooling put together. The other was working for the concrete sculptor Dann Nardi, a minimalist, obsessed with the form of the circle and the temporality of Art. A year later I was married to Bethany and we moved to downtown Chicago. I had a solo show in a coffee shop and a show at Art in the Barn at Barrington. My work was tight, controlled and growing very slowly, if at all. In 2001 we moved to PA where I ran a woodworking company my brothers had started. Building a house together had taught us many skills; running a business was not one of them. After 2 years of taxing my wife’s patience, I took off the business hat and we set off for New York City to seek our fortunes with one child in tow. From 2003-05 I tried my hand at making portraits in the parks. A lot of fun but very undependable. In 2005 I landed an art handling job with Pace Wildenstein (now Pace Galleries) and found myself boxing Picassos, Hanging DeKoonings and talking with Chuck Close. There, I was put on a crew installing one of the first Sol LeWitt scribble drawings (2005) and have been doing Wall Drawing installations for LeWitt Studios ever since. A note about the scribble drawings: Even in creating someone else’s Art, I have realized that every mark an artist makes adds to his experience. After 8 hours of scribbling on a wall, my confidence with a pencil is like a diesel locomotive. In 2008 I worked at MassMoca helping to install the 25-year retrospective of Sol’s work; over 100 wall drawings. Being in a small town away from NYC for 6 months, I took along paint and canvas. Among those canvases were a couple of rolled up paintings I had done at Pratt. When I unrolled them, all those indescribable feelings were winking out at me. It was like finding an old treasure map. This was where I had broken it off. This was where I had to return. So what you see now is me, finally, after almost 20 years, putting on my smock and beret, sticking my thumb through that palette, and daubing like a madman. And I don’t care if it’s better than anything. To me, it’s magic. And I won’t ever let it get away again.